I returned from UK in July 1997. I started my teaching career in October 1997. I received a letter from JPN Kedah instructing me to report for duty at a secondary school in Kedah but it did not state the name of the school. So, I went to JPN to find out and they informed me that there was a vacancy at SMKTSR Jalan Kuala Kedah. 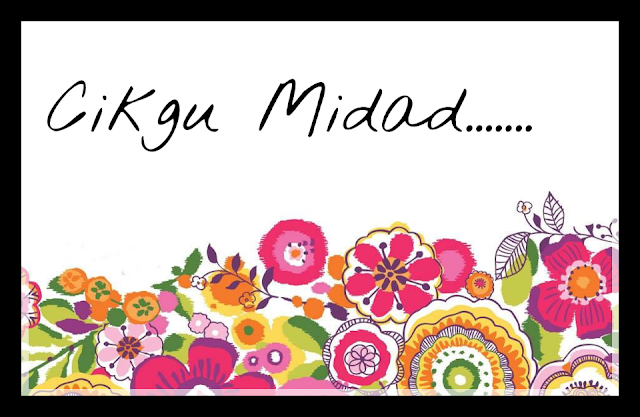 The previous English teacher had just transferred to Kulim after her wedding.... I was surprise because I thought I might ended up in another district. It wasn't easy to get a school near your house. It is about 15 minutes by bus. People asked if I had a 'large' cable but I told them it was pure luck! This school was quite familiar to me since I had done my teaching experience here in 1996. The girls in my area would study here while the boys went to SMKTL. Later, many girls and boys studied at the new SMKSP. The common public transportation for the students was the Kuala Kedah public bus which came every 15 minutes. Since I did not know how to drive or ride a motobike, I had to resort to using the bus as my main mode of transportation to and from school. I chose the 6.45 am bus than the 7.10am bus to avoid the heavy crowd. Still, the bus would be full, carrying students to SMKTL, SMKTSR, SMJKKH, MM, SMKSNC, SAS and KSAH. My students were my busmates. This went on for about 5 years - rain or shine - before I could actually afford to buy a Proton Iswara and also get a driving license. 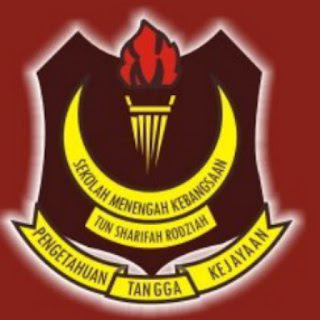 I like the fact that SMKTSR is an all-girl school. The school compounds looked pretty and neat, even though it is quite old. It only contains single and double-storey buildings. It was opened in 1963 under the name of SM Perempuan Telok Chengai before it was offcially opened by YTM Tuanku Abdul Rahman in 1968 and the name was later changed to honour his wife, Tun Sharifah Rodziah. 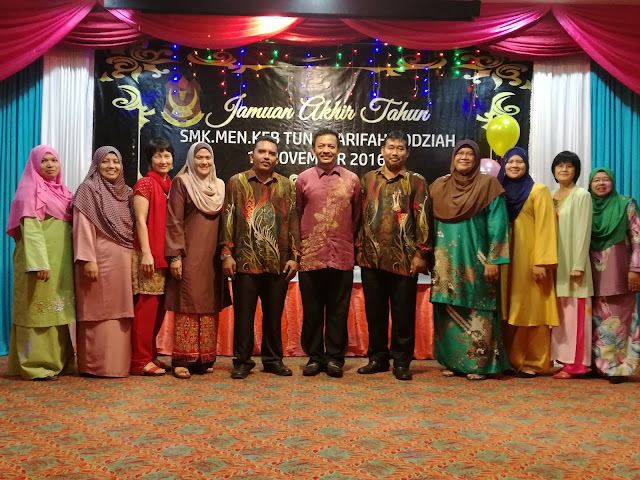 The next Principal was Pn Faridah Abdullah, followed by Pn Hafdzah Ahmad, Pn Azizah Nasan, Pn Ishah Saidin, Pn Rahmah Yusak, Pn Rogayah Talib and the newest Principal who came to this school on the 3rd of May this year, Pn Che Rokiah Md Isa, whose house is located just opposite the school...! We seem to change our Head quite often. Perhaps it is because the school is a popular transit before they retire or have their post upgraded. Different Principals have different style of administration but all of us try to adapt to the new style as best as we can and move forward together. On a personal level, I was delighted to be offered a free trip to Seoul, Korea by the Korean Tourism Organisation in 2015. 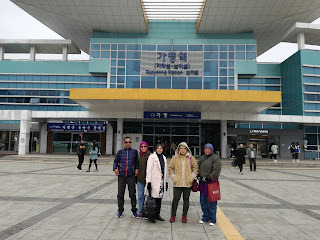 I joined 13 other international winners for 3 nights, 4 days travelling around Seoul, and Gangchon. It felt surreal. Kamsahamnida KTO and Hana Tour, and my Korean-mad chinggu- Vera from Singapore, Tere from Indonesia, Lucky from the Phillipines, Nat from Thailand and also the Japanese and Taiwanese winners.. I moved to my own house in Mergong in 2009. My family now lives with me. The old house in Kuala Kedah stays empty. Its fate is still unknown. Now, I drive my Almera to school everyday. I usually arrive quite early, before 7.00 am. It is a habit that I cannot break. i guess things would be different if I were married and had small kids. Cest la vie. My first batch of sixth form students were in 2003. Many of them stayed in the hostel where I was a warden. That brought us closer and since everything was new, we went through it together. They are now working, they are somebody's wife or mother. So technically, that makes me a 'grandmother'.. ;) I love teaching MUET to the sixth form girls because they are young adults who feels more like a sister than a daughter. The age gap then wasn't that big before but now, I am probably closer to their mother's age. One sad fact was that later, a student by the name of Rohaya, met with an accident and died. Years earlier, the teachers got together to help her further her studies in UMS. This act of kidness was led by Pn Azizah, who is now teaching in Kuantan. Other sixth form teachers who used to teach here include Pn Siti Aminah, who is now back in Johor, Pn Puziah who has retired, Pn Supiah who is now at SMKHK, Pn Mashitah who is in SMKAK, En Azman who is now a lecturer at IPDA, Pn Fatmawati who is now in Trengganu, Pn Nor Shuhada who is now the Principal of SMKAJ, En Ahamad Fauzi who has retired but is still painting and drawing actively, Pn Husna, Pn Shobihah, En Ahmad and Pn Azilah, who no longer teach Sixth Form. How I miss our old days together... At present, the sixth form teachers include our new PK T6 Pn Nooriani, Pn Azura, Pn Azira, Pn Chuah Bee Lan, Pn Lily, Pn Lim Choon Shiang, Pn Rodziah, myself and the three gentleman- En Mutalib, En Nasrul and En Sharuddin.